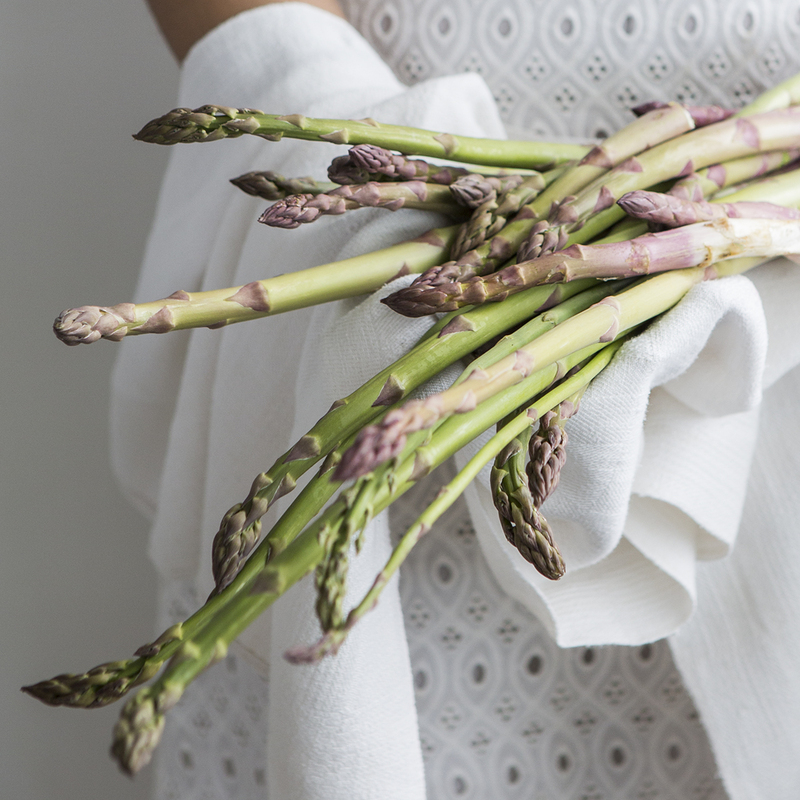 Spring has come knocking with armsful of asparagus. This time of year its earthy flavour is at its sweetest and most delicate. 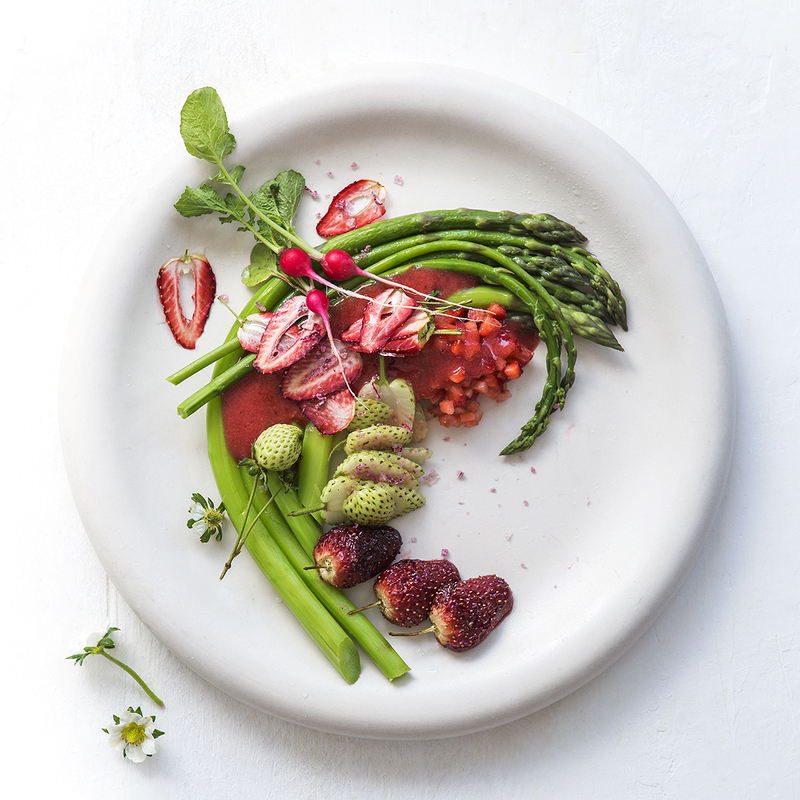 Our good chefs pair it with one of spring’s other most anticipated ingredients – strawberries. This is spring on a plate! Blanch 400 g asparagus and place in ice water. Strain and dry with a clean cloth when ready to use. Clean 50 g green strawberries with a damp cloth to remove sand and slice in halves and some in thin slices. Drizzle with a little fresh lemon juice and sprinkle generously with icing sugar. Season with a little salt and freshly grounded black pepper. Allow to marinate for 2 hours. Preheat the oven to 160°C. Place 100 g strawberries on a baking tray and dust with castor sugar or drizzle with honey. Sprinkle with freshly grounded black pepper. Place in oven and slow roast until strawberries are cooked through but still retain their shape. Preheat the oven to 60°C. Slice 50 g strawberries thinly. Place sliced strawberries on a silpat into a large baking tray. Top with sheet of silpat. Place another baking tray on top of the sliced strawberries to keep them down. Bake for 3–4 hours until they are completely dry. Cool down completely and then carefully remove from silpat. Keep in a dry place until ready to use. Chop 50 g strawberries and a few fresh basil leaves coarsely with a sharp knife. Add a drizzle of aged balsamic vinegar and stir through. Season with salt and black pepper. Remove leaves and stems of 50 g strawberries. Place into a blender. Add a little grated fresh horseradish, a drizzle of lemon juice and season with salt and black pepper. Add 30 ml Babylonstoren extra virgin olive oil and blend until smooth. Look at the image and start with the asparagus. Continue to plate the remaining ingredients and lastly the dressing. Garnish with baby radish and Babylonstoren pink salt. Do you give presentations on how to bake bread? Doing a mother and daughter morning on 4 November and looking for something nice to do.